Nightcrawler is up against the heroic teachers from the Jean Grey School, who have been possessed by an old and deadly foe: the Shadow King. On top of this the Crimson Pirates are thrown in the mix for a bit of fun. 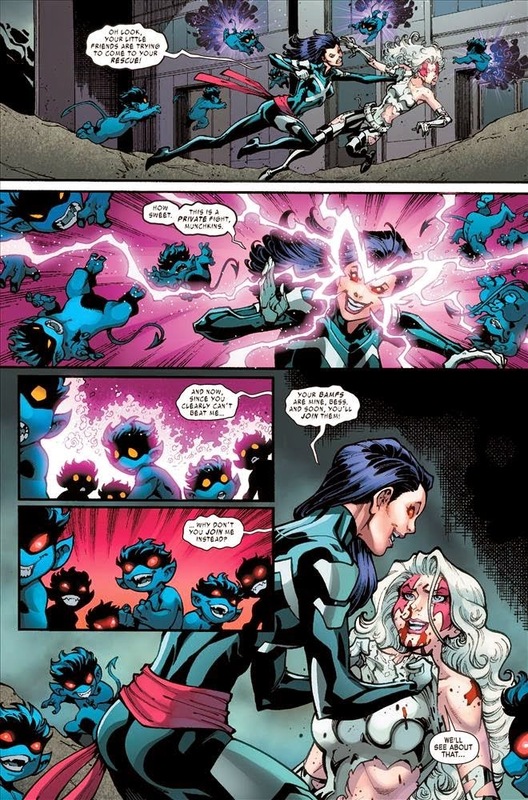 Issue #9 of Nightcrawler continues the story set up in the previous issue but is spliced with flashbacks to the Xavier School for the Gifted days of the X-Men. Approaching it in this manner, writer Chris Claremont uses familiar territory to flesh out more of the plot. I am not entirely convinced that this adds a lot for the audience, but it does feel fondly nostalgic. 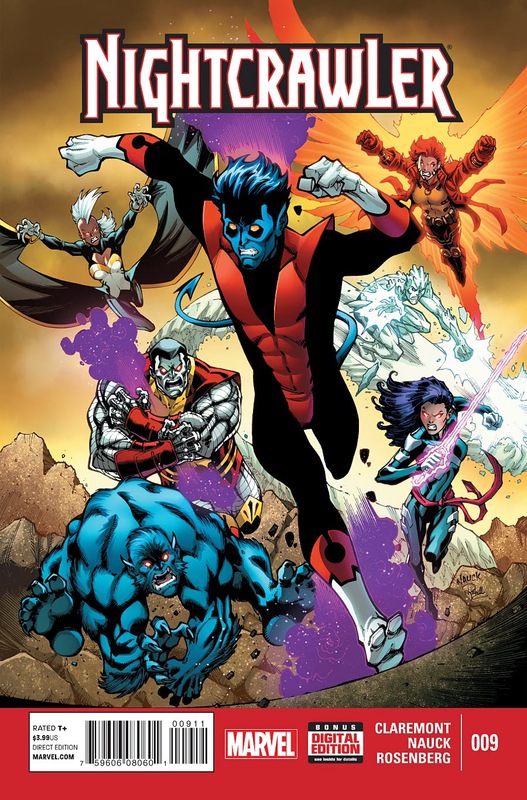 As a series, Nightcrawler has a lot of action and appeals to a wide audience. It is a straightforward and uncomplicated story, involving a large number of recognizable X-Men characters. In addition to the diverse cast, Claremont's story continues to be dialogue heavy, giving letterer Travis Lanham plenty to do in this issue. Despite the unsubtle approach to narrative, the plot is quite linear, clear, and holds itself together well. Given this, artist Todd Nauck streamlines an aerobatic and swashbuckling adventure around the character rapport. I could be reading more into it than intended, but it's possible that Claremont is slightly lamenting the current state of affairs for X-Men comics or stories in general, which haven't panned out as he thought they might. 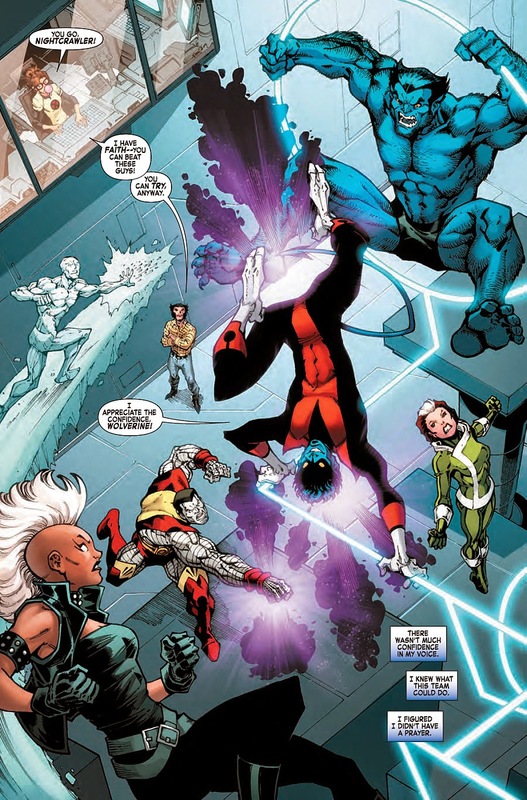 The last panel dialogue on page 13, where a flashback takes place with Nightcrawler and Kitty Pryde, reads, "true, this isn't the future we dreamed of, but power comes with responsibility. I suppose it all comes down to faith. What we do, what we sacrifice, I pray makes the future better." Claremont has been trying to link the past X-Men and the new throughout this series, both in some overtly open ways and some not as apparent. Nauck continues a strong run of form for the series. His style is complementary to Claremont's approach to the story. As a result, pages of art flow in a consistent manner with an even balance. A nice standout in this issue, Nauck's work on the flashback settings has the right feel and pays homage to past interpretations of X-Men characters. To bring the art to life, Rachelle Rosenberg provides vivid colors that are sharp and crisp. Rosenberg focuses on characters, with their colors the dominant feature on each page; the backgrounds, while beautiful, are thus relegated to a lesser role. By doing this, Rosenberg works well with Nauck and Claremont to make this a character-driven story, which is where Nightcrawler hits the mark as a series. What do think of how the characters are driven in Nightcrawler? What do you think the strengths of the series are? Leave your thoughts below or post a message on our Facebook page, and come back next time to see our response.